Starting off the new week with a laugh, here’s a silly story about an mathematics lecturer is claiming that Borobudur was built by Solomon’s “genie soldiers”… You can tell by the comments in the article that nobody is taking the claim seriously. The real question would be, how did this even get on the newspaper in the first place? An obscure group led by an academic from a respected Islamic university in Indonesia is reportedly set to petition the Constitutional Court to declare that the Borobudur Temple in Central Java belongs to Islam. Solomon, who according to the Hebrew Bible was a king of Israel, is known as the prophet Sulayman in the Koran. 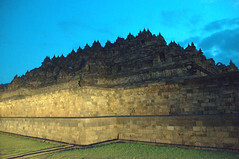 According to the article, the researchers had connected Borobudur with the Kraton Ratu Boko (Queen Bokoâ€™s Palace) near the Hindu temple Prambanan in Central Java, claiming that Boko was actually another name for Queen Balqis, the wife of Sulayman. The researchers, according to the news portal, said supporting evidence included new Islamic mathematical measurements created by Fahmi, which were known only to him. Yes it’s worth reading the comments on the original article. I like the one about the smurfs!